During the month of March, Lansing Art Gallery is extending it's multi-artist show to the upstairs mezzanine gallery space. So come on out to the Lansing Art Gallery during the month of March and support this great non-profit art space! A good friend of my family is about to become a grandma for the very first time! A lady of great style, she knew that grandbaby Blake's already gorgeous nursery should have some Kate Cosgrove Art custom creations. The parents-in-progress (mom featured in photo) were interested in painted letters to hang above his crib. To the family, Congratulations! And to Blake, your room is now ready, sir. My artwork is traveling to more exotic lands than I am these days... The latest locale: Colombia. Juan Marin, is not only the first Colombian owner of Kate Cosgrove Art, but he also became the top winner of my 'FaceBook Fan Page Challenge' by recruiting more 'fans' than anybody! Juan (see photo) braves the harsh Colombian winter to pose with some feline friends and his new art piece, a cat ACEO [mini original painting]. Is it just me, or is his tiger-cat pal looking directly at the painting? Maybe she will be the second Colombian customer... and the first non-human... Thanks Juan! 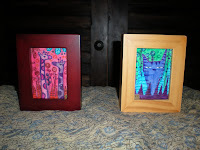 Check out my ACEOs (and more to come this week) created with a new toy, watercolor pens... the colors are vibrant, the stroke a little more bold, see for yourself! Bid today on "It's a Big World Out There"
Bid today on "Edna's Cat"
Edna's cat is based off of an old lady that lived next door to my childhood home. Edna was a chain-smoker in hounds-tooth polyester pants and metallic gold wallpaper from the 70s... She would always try to feed me bowls of vanilla ice cream with cherries in it.